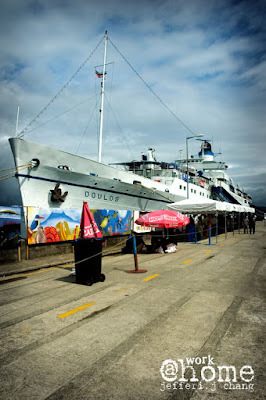 I woke up early to send my mom to visit the MV Doulos, thou i didn’t go up to the ship. 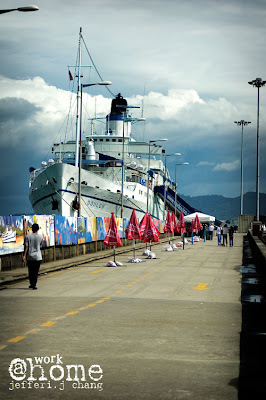 I take this opportunity to snap some couple of photos for my collection and get the feeling of snapping a cruise ship. The sun shines directly to the ship for a few moments before a brief rain starts. I’m not really dare to go over the red tape line for a better angle because this is a private property. Some of the port staff curiously watching me taking some photo of the ship and i hope they don’t think that I’m a terrorist or what. After few moments, I realized that it is going to rain. 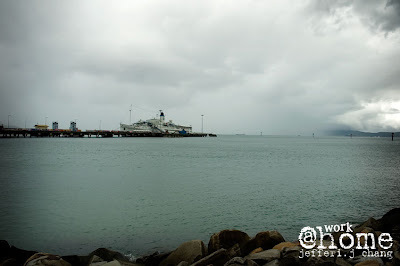 Big gray cloud swarming near the port area at the horizon and at that time I think i should go back to car or went up the ship. Thou, I choose to go back to car. 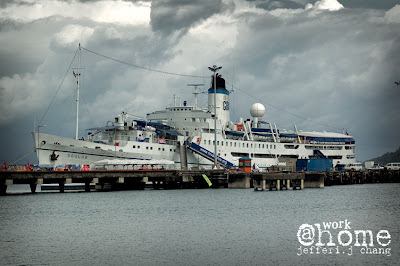 I managed to snap some last minutes of the ship before rain dripping. I have some other port photo and will show it up on the next post. Doulos! I’ve been on Doulos to buy books for 3 or 4 times already. 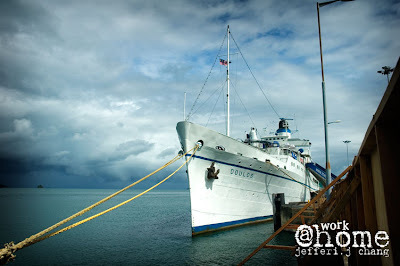 They cannot dock in Miri, so we used to travel to Bintulu to visit the ship. So nice! Ya so nice.. 🙂 the ship next stop is at Brunei then went up again to Philippine dry dock for maintenances. Oh yes. In fact, my cousin just phoned Brunei asking me to go Brunei to visit Doulos. I was like.. how? You want me to swim there? HAhahaha..
i had a chance to be on board too.. it was so amazing!!! n i was heavy rain n almost mid nite.. we were d last visitors thr! !